Disclaimer: I received Henry’s bowl in exchange for an Instagram post about the product, but I decided to post here as well and run a giveaway because I think the CuBowl is so cool! The CuBowl I am giving away is a second dish that they included to help spread the love. You know the slime that can grow on your dog’s water dish? According to the experts at Vancouver startup CuBowl, this slime’s primary function is to “protect and glue microbes to the surface” and it has evolved “to be as hard to wash away as possible.” Gross, right? Consider that these microbes can be harmful bacteria, molds, and viruses — it’s almost enough to toss the water dish altogether. 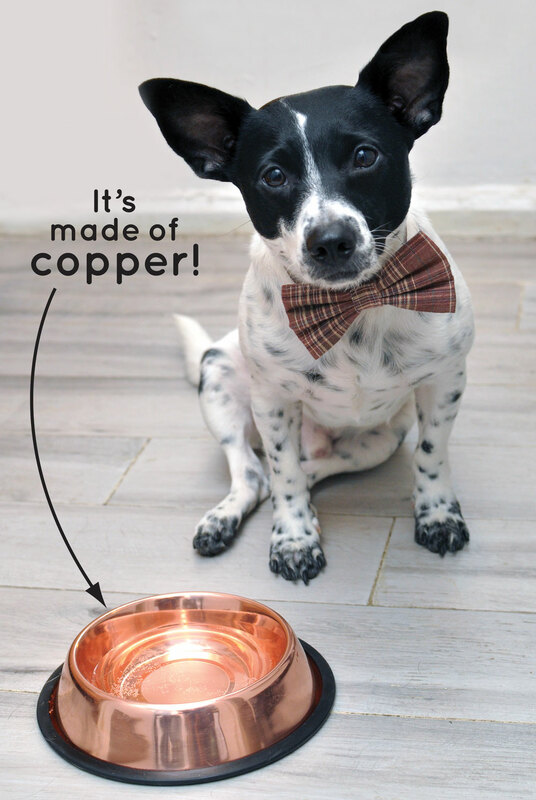 Enter CuBowl: a brand new water dish made of copper, a material with antimicrobial properties. According to CuBowl, copper is proven to kill 99.9% of certain bacteria and 99.9% of adenovirus within 2 hours of contact. 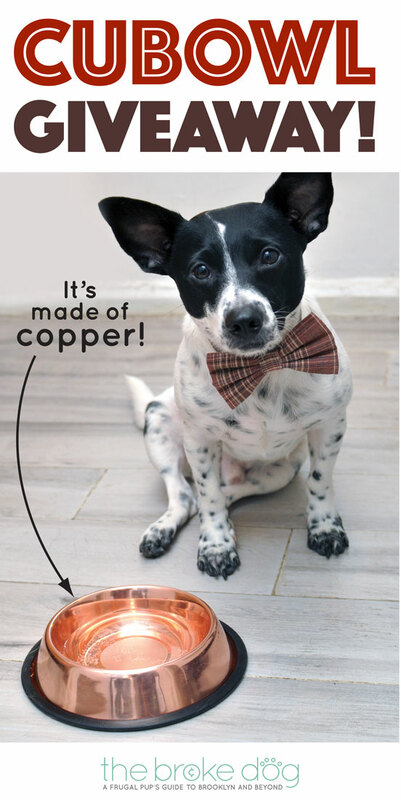 Their website details petri dish tests as well as anecdotes and they claim that dogs prefer communal copper bowls over stainless steel and plastic. CuBowls are available in several sizes, as well as non-tip and traditional styles. Oh, did I mention that they’re BEAUTIFUL? So, how can this save your money? Less “gunk” means your dog ingests fewer harmful microbes, which means a healthier pet and fewer trips to the vet. Plus, if you value nice design like I do, it’s a fun way to justify buying something that’s pretty in addition to practical. I also must mention that I am a big-time nerd, and the science behind this product is so cool! All that being said, these bowls are still an investment item, and cost more than your average bowl, but could be well worth it. CuBowl has just launched its Kickstarter, and you have your chance to buy your own CuBowl at a 20% discount! Click THIS LINK to check it out! We’re giving away a Small, Non-Tip CuBowl to one of our readers! Winner must reside in the USA or have a USA shipping address and will be randomly chosen by the Rafflecopter Giveaway tool below at 12AM EST on April 12, 2016. Good luck! Please note: CuBowls are for water only, not food. Check out their website for details on use and care. It is beautiful!! We would love to win it and show it off on Instagram!!! Cool idea! Nala and Cody would love to win they are both obsessed with water so we can’t have enough water bowls in our house. The pups water bowl is kind of eye sore…something so pretty would be awesome in my apartment! Linus has allergies that are exacerbated by icky bowl water. We scrub and refill his stainless steel water dish 2-3 times a day, and it would be AMAZING to find a product that doesn’t require that kind of maintenance!!!! Also, wow, does that bowl look gorgeous. Isn’t is beautiful?? I love that it’s north gorgeous and practical! Sounds like it would be the perfect solution for Linus – good luck and thanks for entering! What an awesome idea! Would love to win this for my girls! Would love to win one.. My senior has plastic allergies .. And our group is always looking for suggestions on new products.. Unique finds .. My pup is special needs and many special needs dogs have skin sensitivities also. I would love to win for me 3 dogs to use & for all of my foster dogs! We love new bowls and would love this one! ilike this idea of having antibacterial resistance and cleaning. i have the silver bowls with the rubber base but have not seen the copper bowls. i would like one for my girls. i wash their bowls after they eat. the oldest is very messy and get the food in b/t the rubber and the bowl. I care about what our 2 dogs and cat eat/drink. I worry about the slime and build up in their dishes and am constantly washing them out every day. I would love to see how this compares. I am quite familiar with water bowl slime so I would love this bowl. I would feel good knowing that my pups are getting fresh slime free water. I’d love to win because it is so much nicer than the one they have now! I would love to win this for my dog Bobo he loves to constantly have water and it would be great to have a bowl like this for him to enjoy from, thank you for the chance to win. I would love to win one, it’s always nice to have an extra water dish. Very nice dish, would love to have a new bowl! My dog would love a new bowl! Always good to have an extra water dish around. These bowls are BEAUTIFUL! I know my little Bichon, Tiffany, would feel so fancy drinking from it and I love knowing that it makes her water safer. Hey you! These are so cool. I actually work at an independent pet store in Philadelphia and sent a link to these to my boss. She fell in love. I wonder how soon they’ll be doing wholesale. Aren’t they great? Glad you’re helping to spread the word! It’s such a great idea.